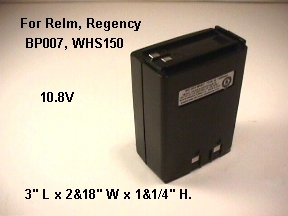 Relm, Regency 2 way radio battery, BP007, WHS150. Ni-Mh battery, 10.8 V , 1800 mah. Dimensions at 3" L x 2&18" W x 1&1/4" H. The battery is made by W&W Inc. Your charger will charge this newer type Ni-Mh battery,. It has 50% longer stand-by time and talking time.